PROGRAM • ATTEND • RESOURCES • EXPO • SAA Website • Session Recordings now available! The information presented and the opinions expressed at ARCHIVES 2017 sessions and events are not necessarily endorsed by the Society of American Archivists or the 2017 Program or Host Committees. See SAA’s Code of Conduct. Register by July 6 and save at least $50 off Advance registration rates and $110 off Onsite rates. A name badge is required for admission to all meetings, sessions, and events. To replace a lost badge, go to the Onsite Registration Desk during registration hours. 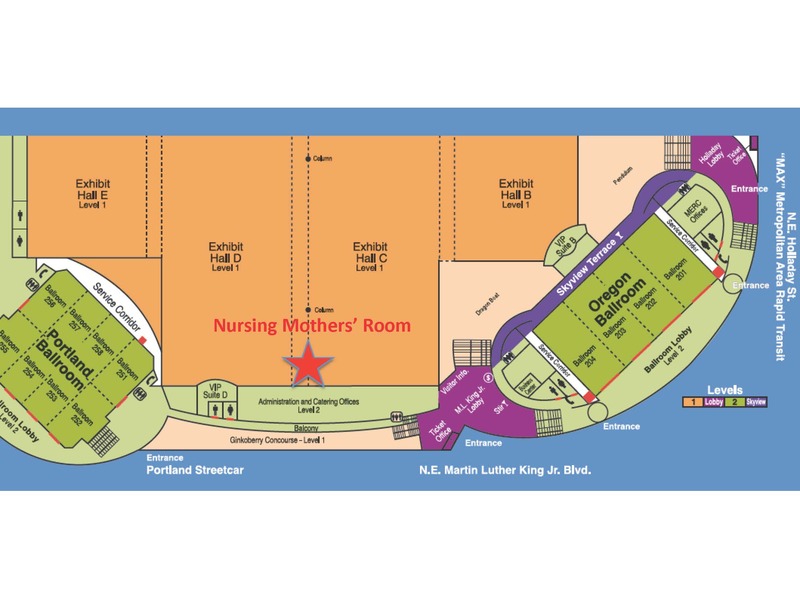 SAA has arranged for attendee use of the Oregon Convention Center’s lactation room during the conference. The room is equipped with a table, chairs, and mini-fridge. To access the room, go to the OCC’s administrative offices located on the second-level concourse (which connects the east and west sides of the convention center). Please check in with the receptionist upon arrival. See map. If you have any special needs in order to participate fully in the conference, please speak with an SAA staff member at the Onsite Registration Desk. SAA has negotiated for concessions to be open during specific times in our section of the Oregon Convention Center. Full menus and maps are available at https://www.oregoncc.org/eat-now. See the Host Committee blog for ideas about where to eat outside of the Convention Center. The Host Committee: At Your Service! Your Portland-area colleagues have joined forces to staff the Advance Registration Desk – and provide you with the information you need to enhance your conference experience with repository tours and open houses, restaurant advice, ideas for on-your-own adventures, and tips on navigating the city and surrounding areas. Tap into the Host Committee’s great ideas and updates at https://archives2017portland.wordpress.com/. We’ve negotiated free Internet access for all conference attendees at the Oregon Convention Center. SSID is “archives2017” No password. Swing by the SAA Bookstore to browse and buy SAA’s latest titles or to chat about an idea you have for a book, module, article, or case study with Publications Editor Chris Prom, The American Archivist Editor Greg Hunter, Director of Publishing Teresa Brinati, and Archival Outlook Coordinator Abigail Christian. Stop by the information tables to learn about your colleagues’ initiatives, contribute to our community service projects, and bid on silent auction items. ARCHIVES 2017 is a great place to meet and greet – and SAA is delighted to offer representatives from our own and related organizations an opportunity to answer your questions and hear your ideas. See the Office Hours schedule. The Networking Café brings together activities to help attendees get connected and get ahead professionally. Wondering about your career options or opportunities for postgraduate study? Want to learn more about SAA’s Mentoring Program? The Networking Café is the place to go! Hosted by SAA’s Membership Committee, the Career Center provides services and opportunities for job seekers and employers. Post your résumé for prospective employers to see at the conference. Review job announcements and meet with employers. Get help polishing your résumé and/or consult with volunteer career advisors. (Attendees are invited to schedule an appointment in advance for consultation with an advisor. Please see the Career Development Subcommittee website for more information: http://www2.archivists.org/groups/career-development-subcommittee. Post your position announcement(s). Place your announcement(s) on file in the Career Center and expand your applicant pool. Meet job seekers and potential employees. Employers who participate in the Career Center will have the chance to meet and speak with job seekers in an informal and relaxed setting. Information tables are available within the Networking Café for graduate archival education programs and allied organizations to distribute program literature and have representatives answer questions one on one. Take this opportunity to make connections in a conversational setting. The MAX Light Rail will get you everywhere you want to be in Portland! The Convention Center MAX Station is conveniently located just outside the OCC, on the corner of NE Martin Luther King Jr Blvd and NE Holladay St. Hop on the Red or Blue line for a quick ride to the Hilton Portland or to explore any of Portland’s many exciting neighborhoods! From the Hilton Portland: Walk 1.5 blocks on SW 6th Ave to the Pioneer Square South MAX station. Take either the Red or Blue line (7 stops, 12 minutes) to the Convention Center MAX Station. As you exit the station, the Oregon Convention Center will be in sight, right across the street!